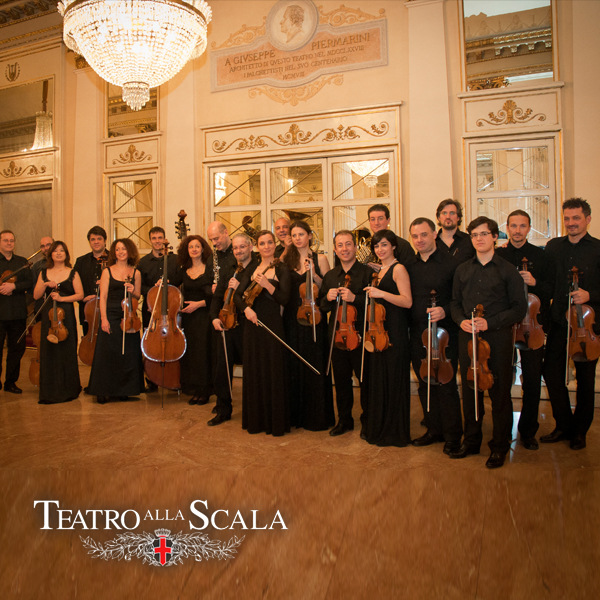 “I VIRTUOSI DEL TEATRO ALLA SCALA” are an asserted ensemble of musicians, all members of the Teatro alla Scala and the Filarmonica della Scala orchestras, who wish to perform together and by doing so to share their common musical experience, collected over the years through the collaboration with some of the World’s greatest conductors. To obtain the highest artistic quality possible, the group is composed of first class musicians, including many solo parts who have all obtained international recognition. Thanks to their presence and to that of the other talented members of the group, the repertoire is broad and versatile. It ranges from the greatest works of Baroque, the Classic and Romantic periods to the Contemporary, with a particular emphasis on Italian virtuosistic music for solo instruments and chamber orchestra. Moreover it comprises Divertimenti, Serenades, Symphonies, Concertos and Nineteenth-Century instrumental transcriptions of Italian opera arias and duets. Teatro Verdi in Busseto for the opening day of Renata Tebaldi Museum. the 2011 IMG Tuscan Sun Festival. Furthermore “I VIRTUOSI” have been invited by the Italian Embassy in Warsaw for the closing event of the 150° anniversary celebration of the Italian Republic fundation and by the “2011 International Chamber Orchestras festival” in Moscow a wide tribute to the instrumental italian music from the classic period to the contemporary. They also recorded three more CD: first of them entirely dedicated to Bottesini’s virtuosistic music for solo double bass and orchestra, distributed by the italian music magazine “Amadeus”; the second CD is a live recording during a concert in 2011 February at Teatro alla Scala, including Tchaikovsky’s strings Serenate; the third a monographic CD/DVD dedicated to Verdi’s music including “Quartetto” and “Variations on Traviata and Rigoletto themes” for clarinet and strings. With the same program they performed in the Salone Estense of Varese (where Mozart played) invited for the first concert of the 2013 “Serate Musicali” season and invited again for the 2014.In 2015 Virtuosi played again at Teatro alla Scala with a program full dedicated to the childrens, including Vivaldi’s”Il gardellino” and Leopold Mozart’s” The children’s sinphony”. “I VIRTUOSI DEL TEATRO ALLA SCALA” usually perform without a conductor.